Facelift customers can get more bang for their buck with our bonus offer for those undertaking training with us. 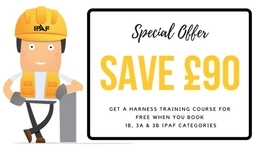 Until end of April 2018 you can enjoy free IPAF harness training (worth £90) when you book IPAF courses 1B, 3A & 3B. Facelift is an IPAF Senior Instructor Training Centre and provides IPAF Operator training courses for all types of powered access platforms including mobile vertical platforms (scissor lifts or mobile vertical personnel platforms), mobile boom (mobile cherry picker), static vertical platforms, static boom platforms (van, truck, trailer and track mounted) and specialist internal and narrow access platforms. We also provide IPAF MEWPs for Managers and the MEWPs Instructor Assessment Programme as well as safety harness training. We’re happy to conduct training at customers’ own premises or at one of our dedicated IPAF training centres in Purfleet, Birmingham, Highstead, Liverpool, Newcastle or Southampton.